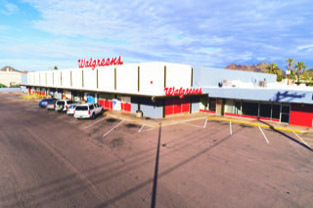 It is reputably one of the oldest original Walgreens stores in the Valley, having opened in 1955 in the commercial center at 8905 N. 7th St. in Sunnyslope. Its mid-century design still boasts the original, three-dimensional red neon sign. But the center itself has struggled in recent years, having lost its other large tenant—Goodwill—as well as a Radio Shack that closed a few years ago. Other smaller businesses have moved out of the south side of the center, leaving Walgreens, a hair salon and a Polish “goodies” place to remain. But the addition of the award-winning Little Miss BBQ in a freestanding building on the property has significantly raised the center’s profile—so much so that the entire shopping center was acquired in November for $3.3 million (not including the Little Miss building, which is owned by the barbecue joint). The shopping center, which is located on the east side of 7th Street, just south of Dunlap Avenue, offers 38,331 square feet of retail space on approximately 2.8 acres. The center was purchased by Capital Development Group and its partner, Rhapsody Ventures of Phoenix. “We brought this asset to market as a unique modernization opportunity in a neighborhood that has recently undergone a noteworthy renaissance,” says John Jackson, associate vice president of Colliers International, who helped negotiate the sale of the center. There already has been an addition to the center, which was announced just after the sale. Planet Fitness, an affordable “no frills” gym, is expected to open in the former Goodwill space sometime this summer. Planet Fitness was started in 1992 and began franchising in 2003, boasting more than 1,600 locations across 50 states as well as in Canada and Latin America. Interior construction on the new Sunnyslope location will begin sometime this month. Currently the closest Planet Fitness locations are 3rd Street and Bell to the north, 33rd and Peoria avenues to the west, and 16th Avenue and Camelback Road to the south. Rice says one of the company’s goals is to have a center no more than 15 minutes away from any potential customer—which makes the Sunnyslope community particularly ideal. The club touts itself as offering a “judgement-free” environment, and appeals to frugalists with a low $10-month membership. “We have high-profile brand and when a Planet Fitness goes into a commercial or retail center it generates more interest in that center, and can attract more customers to nearby tenants,” Rice says. Jason Hersker, director of sales and leasing with Capital Asset Management, is anticipating that will be the case with their latest acquisition in the ’Slope. The new owners are already fans of Little Miss BBQ and the attention that business has brought to the center. Planet Fitness will only raise the profile even further. But the center still faces challenges, including lackluster signage and an awkward configuration of remaining leasable space—including the former Radio Shack space. He says that the new ownership has set aside a fund for tenant-driven improvements, based on the needs of new tenants taking over vacant spaces, including the small spaces on the south arm facing Townley Avenue. Current tenants, Polish Goodies and B&R Hair Etc., have signed new leases, and Hersker says the new owners will work with them on better marquee signage and other ways to help let potential customers know they are there. While the center undergoes its “revitalization” under the new ownership, one thing that won’t change is the overall architecture of the center—and that notable Walgreens sign. Hersker says people are very protective of that store’s sign and mid-century design and while they initially toyed with the idea of “spicing it up,” public feedback eventually nixed it. Walgreens recently inked a lease extension at that location through 2026. Am happy to hear that the Polish place is open. I thought it was closed along with the rest of the stores in there. Glad to hear the area will perk up a bit.